Last edited by Toolless on Tue Jul 13, 2010 2:31 am, edited 3 times in total. 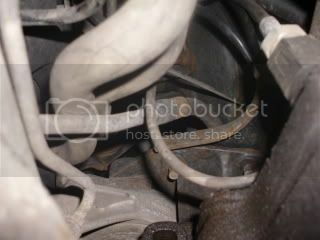 On my radiator system where do I plumb my inlet and out let hoses to? that looks like the map/p1 sensor? whats all that grey and orange hose for? not for the kit your fitting i guess? By 10mm bolts for attaching the tank, I hope you mean 10mm diameter and not 10mm hex size. Having that tank hit you in the back of the head in an accident could be interesting. 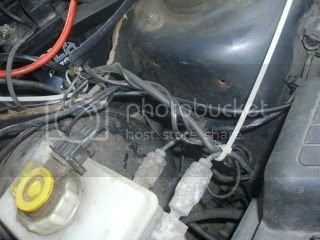 The manifold needs drilling as close to the petrol injectors as you can get so your first option is much too far away. 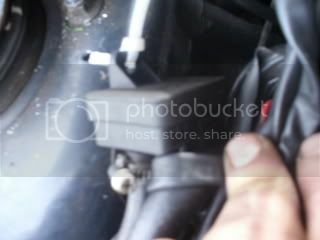 The Map/PI sensor needs connecting to vacuum from the inlet manifold. I thought you had an installation manual? That will tell you. 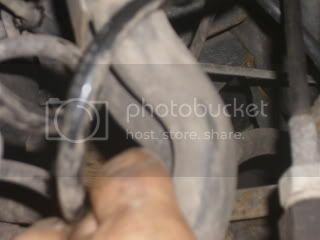 The coolant connections for the vaporiser need to be connected into the cars heater pipework. 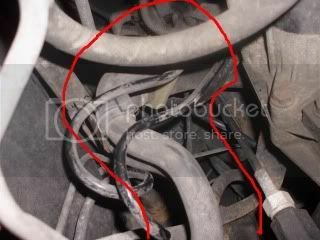 Find the two pipes that lead from the engine bay to inside the car, cut them and put T pieces in. 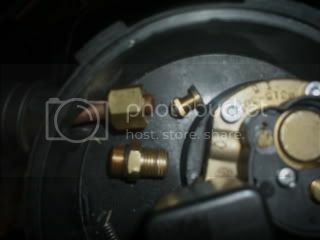 Connect hoses to the T pieces and run those to your vaporiser. The tank is quite heavy. Normal practice is to fit it more forward in the car boot, up against the rear seats. It's better for the car balance. 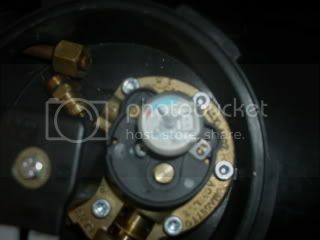 It is important to set it with the valve the right way up and at the correct angle. Have you checked what your insurers need to know, before making the car uninsurable? The picture entitled "The gas hose runs down ..." is a bit scary, but we need to wait and see what the orange hose is about. Last edited by rossko on Tue Jul 13, 2010 9:32 am, edited 1 time in total. Good point Ross, they don't normally have the multivalve on the top do they? 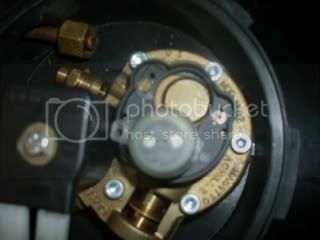 Gilbertd wrote: Good point Ross, they don't normally have the multivalve on the top do they? 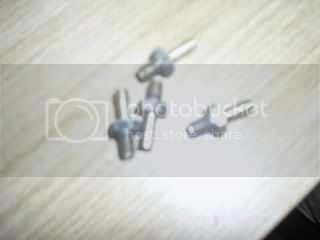 Gilbertd wrote: By 10mm bolts for attaching the tank, I hope you mean 10mm diameter and not 10mm hex size. Having that tank hit you in the back of the head in an accident could be interesting. 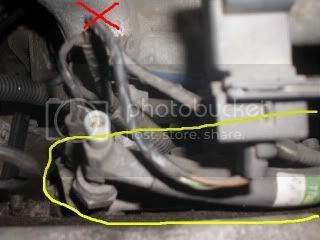 Gilbertd wrote: The coolant connections for the vaporiser need to be connected into the cars heater pipework. 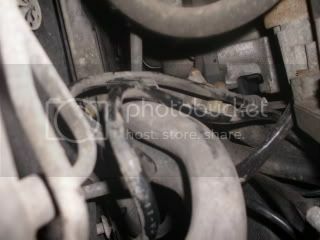 Find the two pipes that lead from the engine bay to inside the car, cut them and put T pieces in. Connect hoses to the T pieces and run those to your vaporiser. What kind of pressure and temperature goes through these pipes just so I know what kind of hose to order? rossko wrote: The tank is quite heavy. Normal practice is to fit it more forward in the car boot, up against the rear seats. It's better for the car balance. Gilbertd wrote: The manifold needs drilling as close to the petrol injectors as you can get so your first option is much too far away. 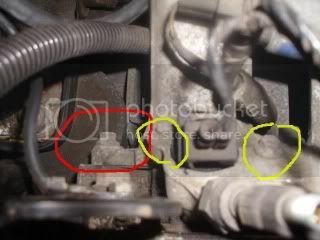 We cant see each injector so to get even closer to them should I remove the fuel rail and start thinking about drilling there or should I just stick to the air inlet manifold marked in red? 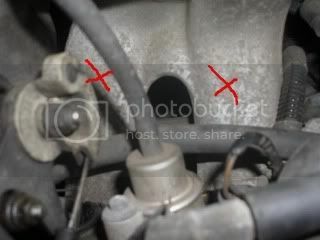 Gilbertd wrote: The Map/PI sensor needs connecting to vacuum from the inlet manifold. I thought you had an installation manual? That will tell you. john_d wrote: whats all that grey and orange hose for? not for the kit your fitting i guess? 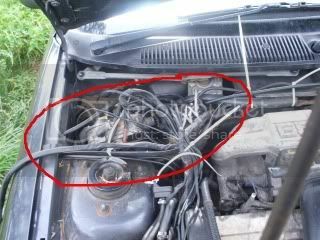 rossko wrote: The picture entitled "The gas hose runs down ..." is a bit scary, but we need to wait and see what the orange hose is about. You dont think I was that daft. You never know, see the answer above! It'll squat down at the back but that is the least of your worries. What happens when somebody runs into the back of you (or you decide to use it for ramraiding)? 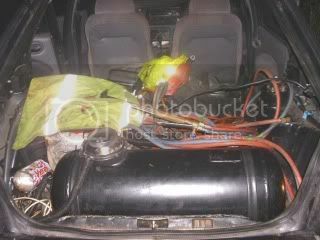 Either the tank breaks free and hits you in the back of the head or it ruptures and fills the car with liquid propane. 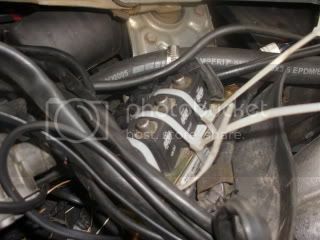 They need to be as close as possible to the petrol injectors so where you put them is up to you. 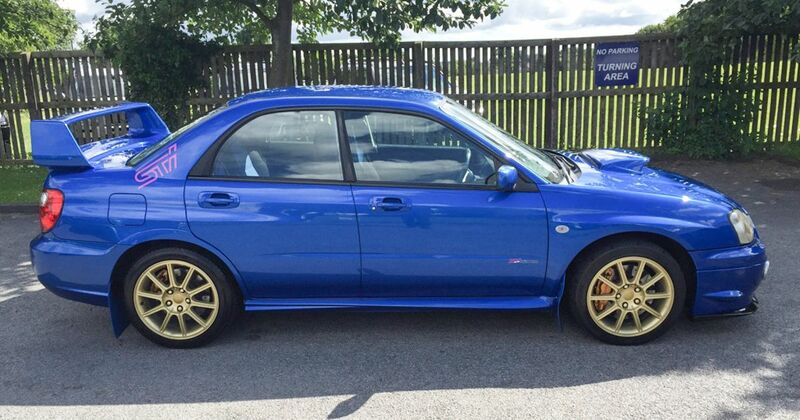 Maybe somebody who has done a conversion on a Zetec will tell you where they need to go. Personally I don't like Fords and I've only ever (briefly) owned 2, which makes them about 0.5% of all the cars I've owned. No, not where the red crosses are. This needs to be close to the throttle butterfly so can come off the plenum chamber, the complete opposite to the injectors. There may already be a vacuum take off in that area in which case you just need to put a T piece in there. 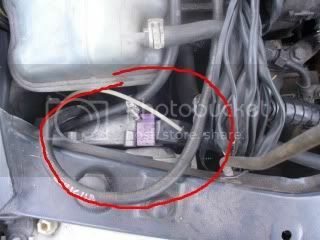 errm, so what exactly is this "gas hose" that runs under the car? For hot water hose, use "hot water hose" or "car heater hose" sold per metre at autofactors. 15/16mm bore will mate up with your vaporiser. Don't use gas hose or garden hose or fuel hose, it will perish. Don't forget you need a lot of hose clips too, at least 8. Which way the water flow goes is usually insignificant, but there must be no heater valves between your new tees and the engine. What about that tank angle - for sure it is incorrect. This leads to incorrect filling and only partial emptying. How is the dialogue with your car insurers going? 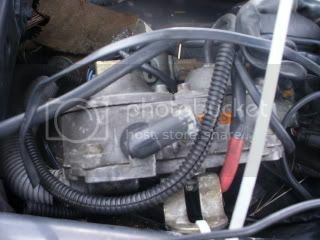 What kindof engine is that? Is it off your Mondao? When thinking about cutting corners, remember you will be drilling and tapping right through the aluminium manifold, chips and swarf will drop straight into your engine if you don't remove it. How is the insurance query coming along? 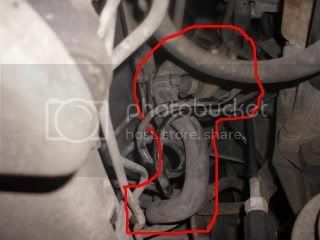 What is the "gas hose" under the car? Hows the tank angle setting doing? 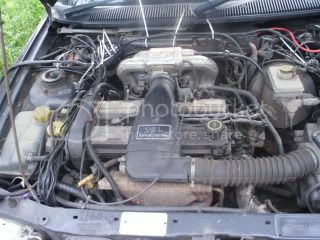 thats a zetec engine, only difference between that and your is that mine is a 2litre, but its idenical to your in every other respect. if you look down behind the engine you should see 2 hoses going through the bulkhead and into the cabin, take the water feed from 1 of those. 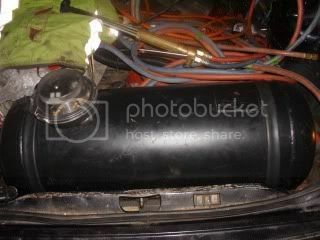 What size do i need and will water pipe do or dose it have to be fuel hose? Why do you need to find the ECU for your car? Dunno what those bits are either, no doubt somebody will recognise them though. 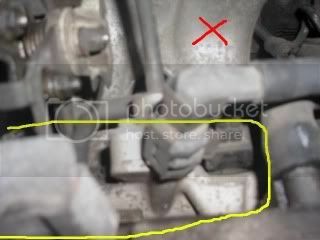 The threads on the injector nozzles ar usually M6. The pipe must be LPG hose (not water or fuel hose) and should be the correct size to fit on the nozzles, usually 4 or 6mm inside diameter depending on what size they are. Looks like someone has dismantled the inlet valve for your multivalve. Guess they've lost the spring? 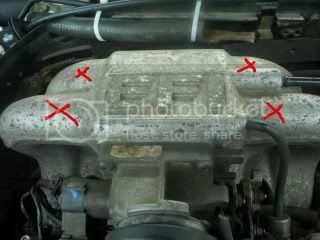 Gilbertd wrote: Why do you need to find the ECU for your car? rev counter and lambda at a guess? the ECU loom is in the corner under the scuttle panel, not sure which side though but it will be obvious as the will be a sh1t-load of wires going to it, the actual ECU is in the car under the dash. goto the thermostat and trace the hose back into the bulkhead, the matrix hoses usually got to the middle of the bulkhead.